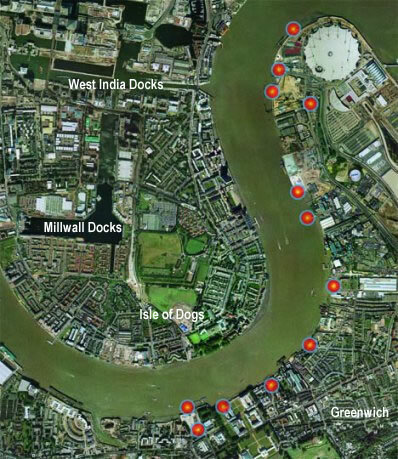 This walk begins at maritime Greenwich, one of the most historic areas of riverside in London. This memoryscape explores the hidden history of London's docks, once the busiest docks in the world. The picture postcard, tourist views of Greenwich are quickly left behind to explore the strange quaysides and deserted industrial landscape of the Greenwich peninsula. The walk is narrated by the people who used to work in the docks and wharfs in London. Their stories are taken from a unique collection of 200 interviews gathered when the docks fell into disuse, which is now stored at the Museum in Docklands. The collection recalls the working life of a port that once had a workforce of 100,000 people - a culture that has almost completely disappeared in a living memory. Most of the bank of the river you walk along looks certain to be redeveloped soon - so this may be your last chance to see what is left of London's working wharfs and shipyards. The red spots on the aerial photograph show areas relevant to the interviewees' memories - recordings are played at these points on the walk. Click on a spot in the picture to find out more. STOP PRESS: Please note that some features on the trails have now been redeveloped - for example Lovell's Wharf and the Millennium Motel. However, the route is still the same and and you can listen to what has now become audio archaeology. The author now teaches a postgraduate course on place, memory and digital heritage as part of the Heritage Studies programme at the Raphael Samuel History Centre. An interview with the author about these trails can be found on History Workshop Online.